The waters in the Gulf of Papagayo are wonderful for surfing, snorkeling, kayaking, SUPing, and jet skiing, and we have a wide array of options for you to choose from! Whether you are a brand new water baby or a seasoned pro in all things wet and wild, we've got a Papagayo watersport that's sure to sure to be a perfect fit for you. Surfing in Guanacaste is king whether you are beginner or a surfing pro. Beginners can enjoy a surf trip by boat to Playa Iguanitas for some beginner to intermediate waves. Seasoned surfing pros prefer our private surfing excursion to world famous Witches Rock? What about a mellow sea kayak tour to a small island of Flamingo Beach or speeding and skipping along the water's surface in a jet ski tour in Playa Panama? Whatever you need, if it is at all water related, the answer is right here waiting for you in Playa del Coco! 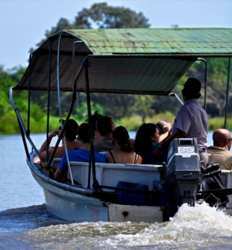 At The Real Deal Tours we pride ourselves on finding the most fun tours at the most fair prices. We think you'll agree, we're good at what we do! Playa Panama, Playa del Coco and Flamingo are all popular beaches for watersports in Papagayo. 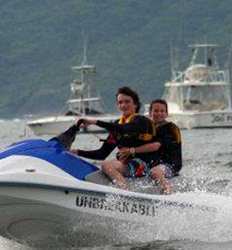 Surfing, kayaking, & Jet Ski Rentals are the most popular things to do in in and around the Gulf of Papagayo and the surrounding beaches. Choose your fun in the sun with our selection of Papagayo watersports below! Surfing in Costa Rica is our foremost passion, and we can´t wait to take you with us! If you´re looking for the surfing trip of a lifetime in the world famous Pacific Coast waves of Guanacaste, you have come to the right place! So if you´ve been looking for the perfect team to make your surf trip of a lifetime a reality, look no further! Private Surfing Excursion Witches Rock & Ollie's Point deposit is $50.00 and $10.00 per each additional person. 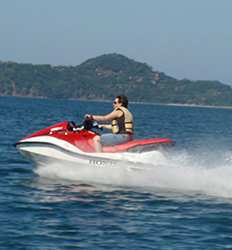 If going on a group tour is not your thing, we offer Jet Ski rentals that allow you to play in the waves and explore the Gulf of Papagayo at your own leisure. There´s a lot to see and explore along the peninsula including natural caves & secluded beaches. And if you´re lucky, you may find yourself spending time riding along with a dolphin! The Gulf of Papagayo Jet Ski Tour allows you to explore the peninsula and its pristine beaches-most of which are only accessible by a watercraft! One of the joys of exploring the ocean on a Waverunner is the possibility of dolphins jumping and riding along the Jet Ski next to you! 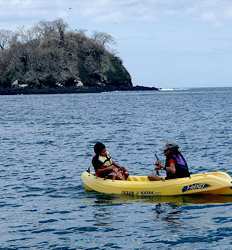 Grab your own ocean kayak or share one with a friend and let´s head out to Guanacaste´s Flamingo Bay and explore the famous Catalina Islands & Isla Plata. Our Flamingo Sea Kayak & Snorkel tour is a small group tour so you will feel safe to snorkel " explore the secluded bays with our excellent guides by your side. So grab your paddles & book your ocean kayak to Isla Plata today! 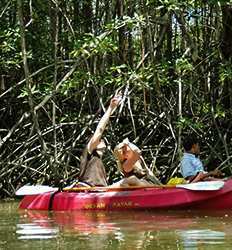 Ocean Kayak Isla Plata deposit is $10.00 per person. The amazingly calm flat water of Flamingo Bay is perfect for newbies and pros alike to explore the bays of Conchal, Brasilito or Puerto Viejo de Conchal on your own Stand Up Paddle board. After a short lesson to make sure everyone has the hang of things, our Flamingo SUP tour takes out to the secluded beaches of Isla Plata. An unforgettable Costa Rica vacation experience! 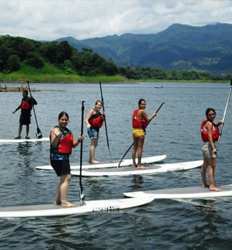 Flamingo Beach SUP Tour to Isla Plata deposit is $15.00 per person. Flamingo beach, Conchal & Brasilito are all great surfing beaches in Costa Rica and our Flamingo Beach Surf Lessons are a great way to test your surfing prowess. Excellent surf guides with boards for all levels, surfing in Flamingo can´t be beat!